Flying at night, especially when you are a new pilot, can be intimidating. While flying at night is not necessarily more dangerous than it is during the day, it’s important to recognize and prepare for the different challenges flying at night presents. 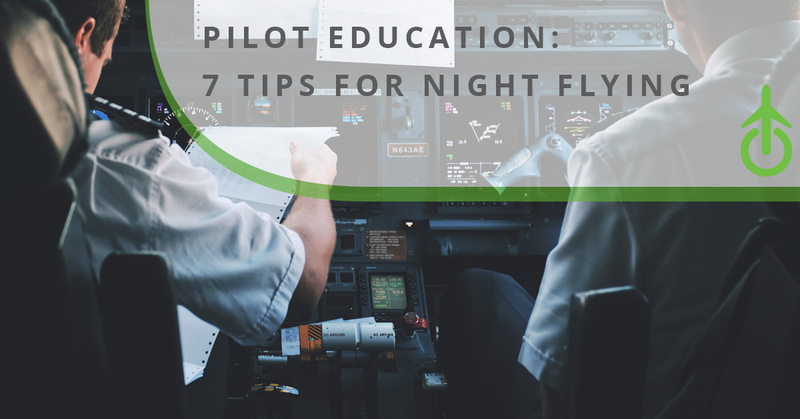 Today, we are going to share seven pilot education tips for night flying to help ensure your night flight goes smoothly. There is something magical and peaceful about night flying — especially when the weather is clear and the stars are bright. If you didn’t get adequate sleep before your flight you can easily fall asleep in this peaceful atmosphere, which can be dangerous for not only yourself, but also for other aircrafts and passengers. Before your night flight, make sure you’re well-rested and bring something to help keep yourself awake (i.e. caffeine or music). When your vision is limited, it is more difficult to do even the most simple tasks. Before your night flight, make sure you plan ahead and give yourself extra time to properly prepare for your flight. Expect everything, such as your preflight checks, to take longer than usual. The cockpit of an airplane, especially in older models, has limited lighting. Therefore a flashlight (or two) may come in handy. To keep your hands free, a headlamp may also be a good idea. For optimal vision, consider a flashlight with both white and red lighting. At night, not all airports are open for fuel service — and not everything always goes as planned. Therefore, it’s important to be prepared by having extra fuel on-hand. This will keep your options open if you need to reroute for weather or land at an alternative airport. At night it is more difficult to spot bad weather than it is during the day. That being said, before your flight, it is a good idea to double check the weather and prepare accordingly for any bad weather that may arise. During your preflight check, don’t forget to test the aircraft lights. Also do a quick self-test to make sure you know where the important levers or knobs are in case the lights malfunction. It’s also a good idea to review the airport lighting systems to ensure you know what all of them mean before encountering them. One of the most important pilot education tips for night flying is to be cautious of visual illusions. Many pilots fly either too high or too low at night because of these false visuals. Falling for these visual illusions can result in bumpy landings, unwanted turns, disorientation, and other dangerous situations. Are you looking to brush up on your pilot skills? At CPat Global, we are passionate about pilot education and offer many computer-based training courses to keep you up-to-date with the latest knowledge and trainings. Explore our services today and learn how we can help you enhance your skills.